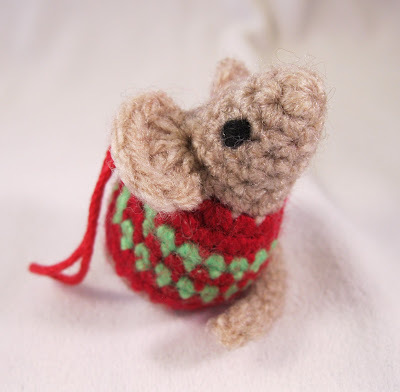 My next free pattern for Christmas is a slight variation on my Little Kissing Mice pattern, so you can make a cute little mouse with a Christmassy red and green stripy sweater. You can add a loop so you can hang it on your Christmas tree, give it as a sweet little stocking filler, or fill it with catnip as a present for your cat. Approximate size: 5cm/2" long without tail. Work in rounds unless otherwise stated and do not join rounds unless told to. Use a stitch marker to mark the start of a round - a small piece of different coloured yarn placed under the stitch at the start of the round will do. To start a round, you can use the magic ring method, but I prefer to ch 2, and work the appropriate number of sc into 1st ch. If you work the sc over the tail of yarn as well you can use that to pull the hole tight. When changing from one colour of yarn to another work the stitch before the change until there are two loops left on the hook. Then use the new colour for the final yarn over hook and pull through. A natural fur colour for the head and tail. Two colours of yarn, such as red and green, for the body. Small amount of black yarn to embroider eyes. Small length of cotton yarn. Start with natural fur colour yarn. Round 1: Ch 2, work 4 sc into 1st ch - 4 st. Round 2: [2 sc in next st, sc in next st] 2 times - 6 st. Round 3: [2 sc in next st, sc in next 2 st] 2 times - 8 st. Round 4: [2 sc in next st, sc in next 3 st] 2 times - 10 st. Round 5: Sc in each st around – 10 st. Round 6: [2 sc in next st, sc in next 4 st] 2 times - 12 st. Round 7: Sc in next 6 st, [ear, in FLO of next st: ss, ch 2, 5 dc, ch 2, ss], sc in next 3 st, [ear as before], sc in next st – 12 st (counting each ear as one st). Round 8: Sc in each st around, working into the back loop behind each ear – 12 st.
Stuff head and use black yarn to sew eyes. Change to first yarn colour for body. Round 9: [2 sc in next st, sc in next st] 3 times, sc in next 6 st – 15 st. Round 10: [2 sc in next st, sc in next 4 st] 3 times – 18 st.
Change to second yarn colour for body. Round 11: Sc in each st around – 18 st. Round 12: [Sc in next 2 st, 2 sc in next st, sc in next 3 st] 3 times – 21 st. Round 13: Sc in each st around – 21 st. Round 14 - 15: (2 rounds) Sc in each st around – 21 st.
Change to natural fur colour yarn. Round 16: [Sc2tog, sc in next 5 st] 2 times, sc2tog, sc in next 2 st, [tail: ss in next st, ch 20, miss ch next to hook, ss 19, ss back into original st], sc in next 2 st – 18 st. Round 17: Sc2tog 2 times, sc in next 6 st, sc2tog 4 times – 12 st. Round 18: Sc2tog 6 times – 6 st.
FO, leaving a length of yarn. 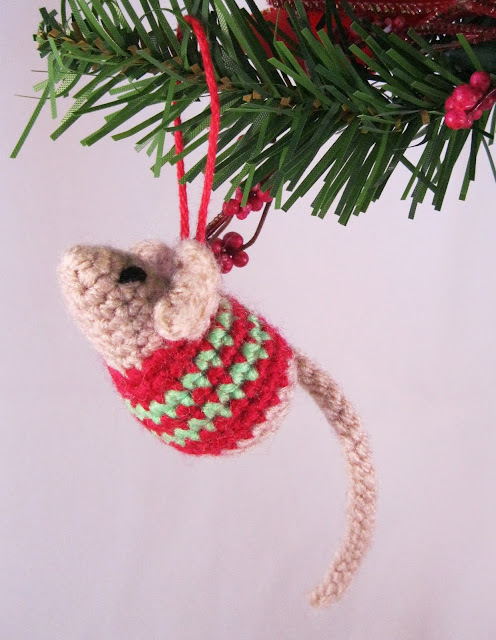 Using cotton yarn, sew a loop behind the head if you want to hang your mouse as a decoration. Finish stuffing and sew up bottom of mouse neatly - if you stuff the body well it will sit up nicely. 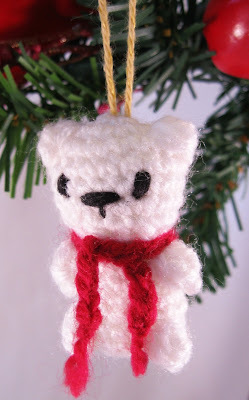 Another simple idea for a little tree decoration is to make one of my Little Teddies using white yarn and give it a red scarf. For more Christmas crochet ideas, I also have a Chubby Gnome pattern in my Etsy shop which includes instructions to make these Christmas characters - a cute little Santa and Elf. If you especially love mice and would like to make some slightly larger ones, try my Wee Mousie pattern. Keep an eye out here and on my Facebook page as I'll be posting four totally new mini Christmas patterns. Of course, go ahead, feel free to share any of my free patterns. I'm so pleased you like it! Hello, I love all your patterns and was wondering if finished products can be sold? 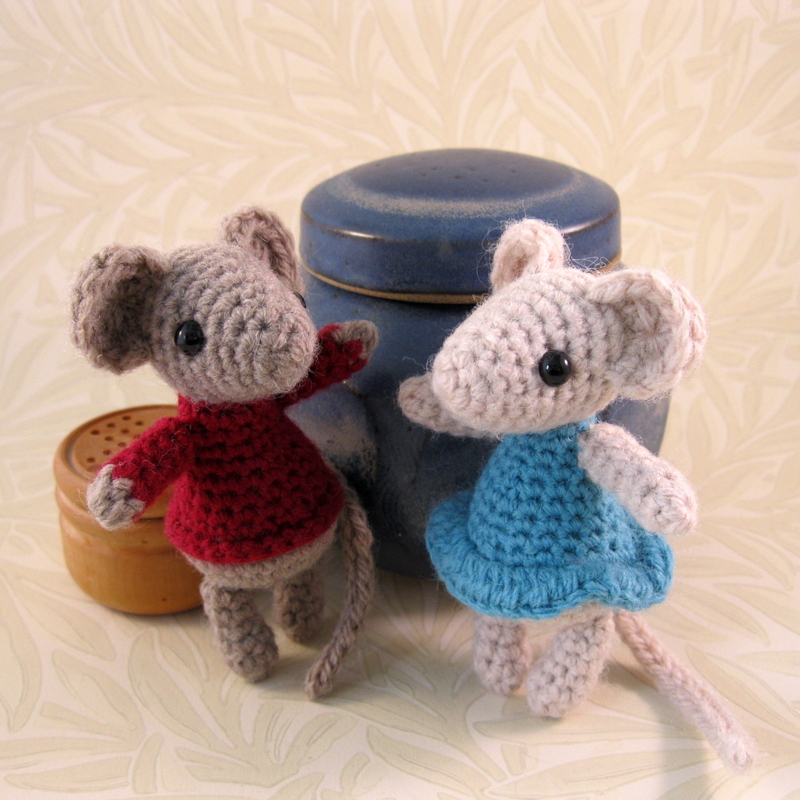 Generally I'm fine with people selling products made from my patterns, particularly these little free ones. If I can just be credited (Lucy Collin or Lucyravenscar) as the designer and maybe have a link to the pattern, that would be great. Thank you so much that's very kind. I certainly will credit you as the designer. 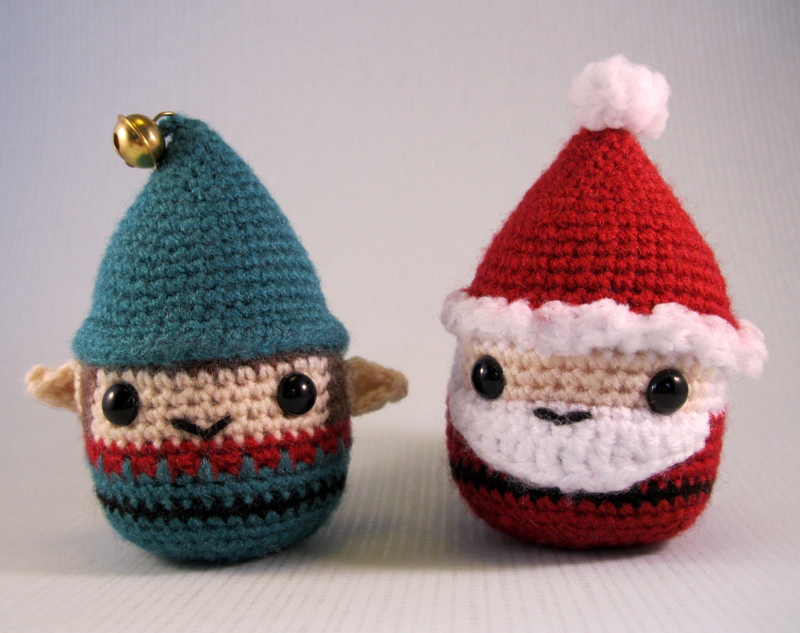 I love these little guys and am making one for each of my children for Christmas. For my daughters I added a little skirt. I did this by [2 sc then 1 sc for one round] in the front loops only of the last round of colored thread before switching back to fur color. When I switched back to the fur color I just continued with your pattern starting in the back loops of the row before. It turned out really cute! I wish I could attach a picture. That's a great idea Tamara, thanks for sharing! Are you on Ravelry? You could share the photo there. It's not a daft question at all. When making amigurumi (the Japanese name for crocheted toys) the normal way to work is to keep crocheting round and round in spirals, and not to join the rounds. That keeps everything looking smoother, although it can be a bit of a pain with stripes. You just have to make sure you know where the start of each round is, so mark the start of each round as you work it.